We're publishing something a bit different than our weddings and engagement sessions. Since Christmas is right around the corner (4 days but who's counting ;), I wanted to share a favorite part of the holiday season: baking! I've been in the kitchen since I was six years old. I'm not even exaggerating. I would wake up before my family every Saturday morning and make pancakes.While it sounds super precious (because I was indeed an adorably chubby kid), my family eventually tired out of pancakes, so I moved on to cookies. 22 years later, I certainly have my favorite recipes, and I'm so excited to share. Special shoutout to my dear friend and wedding industry peer, Megan with Megan Styled for designing and styling these amazing cookie and cocktail pairings. Enjoy! Enjoy! Enjoy! Combine milk with half-and-half in a small saucepan. Warm over medium-low heat, then stir in chocolate chips. Stir until melted. 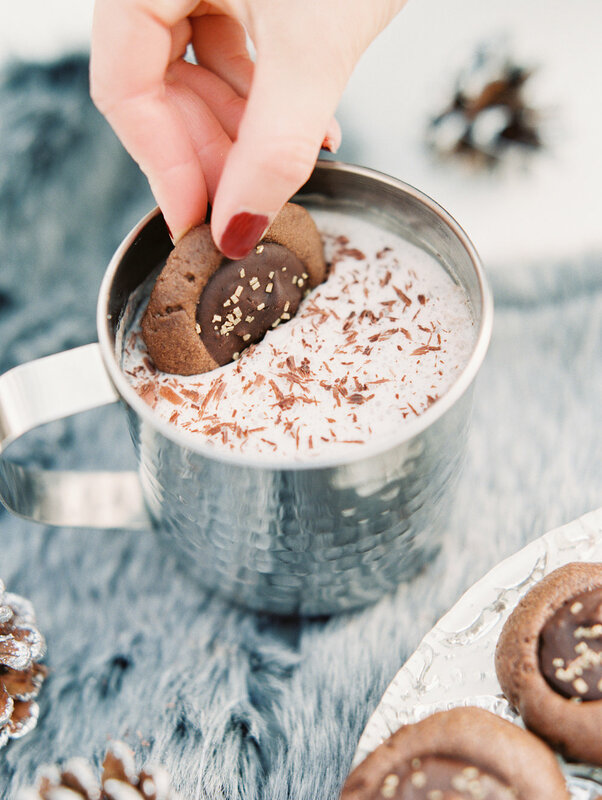 Divide hot cocoa into mugs, filling ¾ of the way full, filling the remaining ¼ with baileys. Garnish with whipped cream and chocolate shavings. Preheat oven to 350 degrees and line baking sheets with parchment paper. Using an electric handheld or stand mixer, beat butter and sugar for two minutes or until fluffy. Add the egg, vanilla and espresso powder and beat at medium speed for another 2 minutes. Add flour, cocoa powder and salt. Beat slowly until just incorporated. Stir in 1 TBSP of heavy cream for a smooth consistency. Roll dough ¾ ounce balls and place on baking sheet. Using thumb, press down into dough. Bake cookies just until they are set, about 7 minutes. While cookies are cooling on baking rack, make ganache. Create a double boiler using a saucepan and metal mixing bowl. Pour 3 inches of water into saucepan place the double boiler on top (make sure it isn’t touching the water. Pour chocolate chips into mixing bowl. Place double boiler over medium heat. Stir the chocolate chips continuously until the boiling water below the bowl melts the chips. Take double boiler off of heat and stir in heavy whipping cream, vanilla and espresso powder. Fill thumbprint cookies with ganache and let cool. In a medium saucepan, over high heat, combine the milk, heavy cream, cinnamon and cloves. Bring to just to a boil, stirring occasionally. Remove from the heat and gradually temper the hot mixture into the egg and sugar mixture. Then return everything to the pot and cook until the mixture reaches 160 degrees F. Remove from the heat, stir in the rum and vanilla. Remove whole cloves pour into a medium mixing bowl, and set in the refrigerator to chill. Meanwhile, in a microwave-safe bowl, cover the dates with water and microwave at high power for 1 minute, just until the dates are plump. Drain well. Slice dates into pieces. In the bowl of a standing electric mixer fitted with the paddle, beat the butter with the sugar at medium speed until smooth. Beat in the eggs. In a small bowl, whisk the flour with the baking powder and salt. Add the dry ingredients to the butter mixture and beat at low speed until combined. Add the nuts and dried fruit and beat until combined. Line 1 baking sheet with parchment paper. Transfer the dough to a work surface and roll into six 10-by-3 inch log. Bake for 30 minutes, or until golden and firm. Let the logs cool for 15 minutes. On a work surface, using a serrated knife, slice the logs on the diagonal 2/3 inch thick. 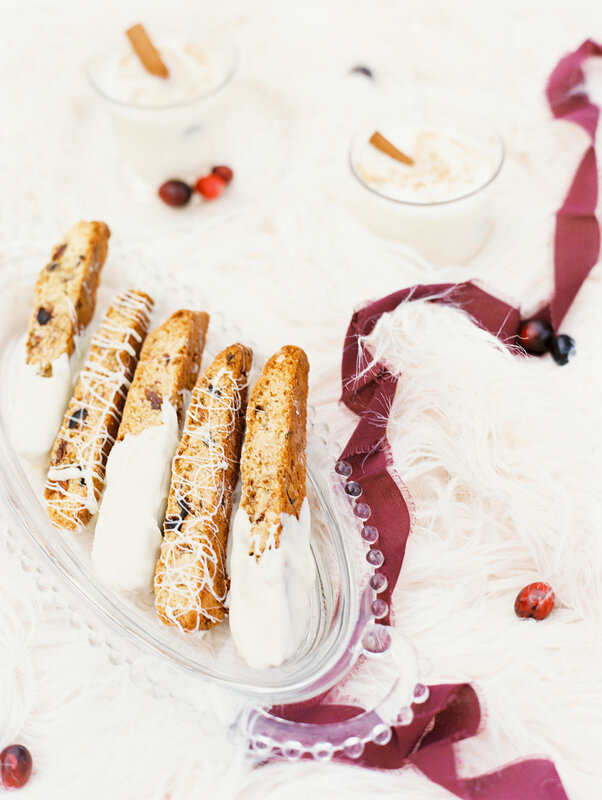 Arrange the biscotti cut sides up on the baking sheets and bake for about 18 minutes, until lightly browned. Once cooled, dip in melted white chocolate and place on parchment paper for cooling. Place ingredients from cinnamon sticks through lemon juice in a pitcher. Place pitcher in the refrigerator preferably overnight. Once flavors have marinated, add honey to taste. To assemble drink, mix cinnamon and sugar in a bowl. Moisten the rim of the wine glass then dip into the cinnamon and sugar for a candied rim. Pour sangria mixture into wine glass ¾ of the way full and top off with club soda to taste. Mix dry ingredients in a large bowl with a whisk or the paddle of a stand mixer just until combined. Add the butter and mix at a low speed for about a minute and a half until mixture is sandy. Reduce speed of the mixer and gradually add molasses and milk until the dough is evenly moistened. Refrigerate dough for 2 hours. While dough is chilling, make cinnamon frosting. Beat 1 cup (2 sticks) butter, softened, in large bowl of an electric mixer (whisk attachment) on medium speed until light, fluffy. .Add 1 teaspoon vanilla, cinnamon and powdered and beat at a medium speed until frosting is fluffy. Add heavy cream 1 TBSP at a time until the desired consistency is reached. Refrigerate until cookie sandwich assembly. Preheat oven to 350 degrees and line two baking sheets with parchment paper. Roll dough into ¾ ounce balls for even cooking and uniform sandwiches. Coat cook dough balls in sugar and put on baking sheet. Using the bottom of a clean glass, press dough into a disk shape (be careful not to make the cookies too thin). Bake cookies for 7-9 minutes or just until they are set. You don’t want to overcook. Once cookies have cooled, assemble into sandwiches by placing ½ TBSP of frosting into the center of the cookie and place the second cookie on top.